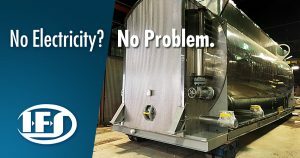 As an industrial process engineering company specializing in modular, engineered-to-order process packages for the Oil & Gas industry, we find that our units are frequently installed at remote sites that present many challenges. In this project for Ecuador, the customer needed a very large heater for use on an unmanned offshore platform and there was no electrical power available at the site. Learn how we dealt with these challenges. Petroamazonas EP is the largest Oil & Gas E&P operator in Ecuador. It is a government owned oil company; however, it possesses special autonomies that were granted to it, when it was formed out of the former Occidental Ecuador onshore Block 15. Today, Petroamazonas operates 20 blocks in Ecuador, including 3 off the Ecuadorian coast. One of the offshore blocks is Block 6, which contains the Amistad Gas Field. This platform was originally under concession to EDC, and was passed on the Ecuadorian government in 2011. Petroamazonas operates this field since 2013 and started the process of “Optimization of the Production Facilities at the Amistad Production Platform”. IFS had already supplied high pressure manifolds at the initial stages of the optimization process for this platform. For this final, more critical stage, the Amistad Platform required the addition of a production, gas line heater in order to avoid condensation in the submarine line that delivers its gas to the Machala Power Plant and other industrial users. This heater needed to have a 10,000 psig maximum working pressure rating and be designed for 40 MMSCFD of gas to be heated twice, before and after a pressure reduction stage. In addition to this, the platform is unmanned and has no power available. Per Petroamazonas requirements, the delivery needed to be done per Incoterms CPT (Carriage Paid to) Ecuadorian port. IFS supplied a horizontal, indirect line heater, using a 50/50 Glycol/Water bath solution. The heater was designed with two separate coils, each capable of handling 40 MMSCFD of gas, 6 BPD of crude oil and 60 BPD of Water. These coils were rated for 10,000 psig MAWP. 2 natural draft burners provided a total 10 MMBTU/HR of heat to these coils. The heater is controlled by pneumatic panel, which does not require any electricity for its control and monitoring of the system. 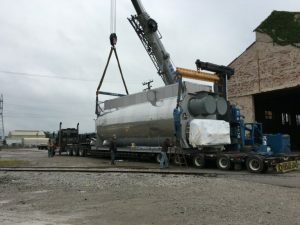 This high pressure line heater had a total shipping weight of 130,000 lbs (exclusive of 15,000 lbs of auxiliary pipe, components sand exhaust stack shipped in 40 ft container) and dimensions of 36’ L x 13’ W x 14’ H. The oversize transportation from the factory all the way to the port in Ecuador was also handled by IFS.